San Jose is a beautiful city in California. It is the administrative center of Santa Clara County. San Jose is home to some 945 000 people. San Jose was founded in 1777. Then it was called El Pueblo de San José de Guadalupe. This was the first city in the Spanish colony of Nueva California, which later became known as Alta California. The city served as an agricultural community to support the Spanish military in San Francisco. In 1850 San Jose became the first capital of California. After more than one hundred and fifty years the small agricultural town remains the last undeveloped land around the San Francisco Bay. In San Jose suddenly increased the demand for housing from soldiers and veterans returning from World War II. Expansion continues in San Jose to the middle of last century, the city occupies more space. The rapid development of high technology and the electronics industry further accelerate the transition from the agricultural center to an urban area. In 1990, alongside the development of high-tech city it became known as the capital of Silicon Valley. Today the city is the largest city in the San Francisco Bay. Before European settlement into the place where today the city of San Jose is, it was inhabited by some of the Native American inhabitants - the Tribe Ohlone. The first permanent presence of the Europeans began with the construction of a series of Franciscan missions established in 1769 by Father Junípero Sera. San Jose was founded in honor of St. Joseph as the first civilian settlement in Nueva California. In 1821 San Jose is under the control of the Mexicans, having interrupted their relations with Spain. Then, San Jose was part of the United States. In 1906, the San Francisco earthquake was bad for San Jose. It killed over a hundred people. During World War II the city experienced a turbulent period. At that time the city's economy shifted from agriculture. The largest employer is a local cannery. In the middle of last century, a center for the research and development of high technologies opened here. This pre-empted the development of the city's economy. In the sixties of last century, the city joined the neighboring areas of Alviso and Cambrian. This provides space for the creation of the suburbs of San Jose. Development of the city continues in the coming decades. 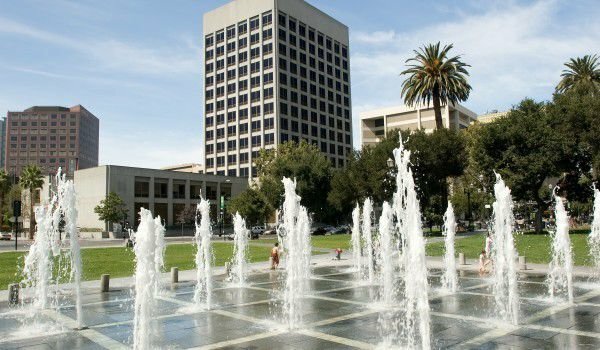 The position of San Jose in Silicon Valley attracted investment for economic development and population growth. Since the seventies of last century, there is an updated plan for the development of urban boundaries. The city continues to grow.